Saudi Arabia has pledged investment deals worth $20bn (£15.5bn) with Pakistan which is seeking to bolster its fragile economy. The deals include funding for an $8bn oil refinery in the city of Gwadar. It comes as part of a high-profile Asian tour by the kingdom’s Crown Prince Mohammed bin Salman. Pakistan is suffering a financial crisis. It has only $8bn left in foreign reserves and is looking to international backers for support. Prime Minister Imran Khan has been seeking help from friendly countries in order to cut the size of the bailout package his country is likely to need from the International Monetary Fund, under very strict conditions. The country is seeking its 13th bailout since the late 1980s and Saudi Arabia has already provided a $6bn loan. Pakistan also said it would confer its highest civilian honour on the Saudi crown prince, the Order of Pakistan, a day after the investment deals were finalised. Who is Saudi’s Crown Prince Mohammed bin Salman? The move is at odds with other countries who have condemned the Kingdom over its role in the murder of dissident journalist Jamal Khashoggi last year. Saudi Arabia and Pakistan signed provisional agreements and memorandums of understanding in the energy, petrochemicals and mining sectors, according to reports. Pakistan is the first stop on an Asian tour by the crown prince, known as MBS. He is scheduled to be in India by Tuesday and will visit China on Thursday and Friday. The prince is seeking to recast his international image in the wake of the Jamal Khashoggi affair. The journalist was murdered at the Saudi consulate in Istanbul in October. Against this backdrop, the current tour can be seen as a charm offensive by MBS, who is seeking to bolster relationships with dependable allies as he doles out cash, says the BBC’s Abid Hussain. 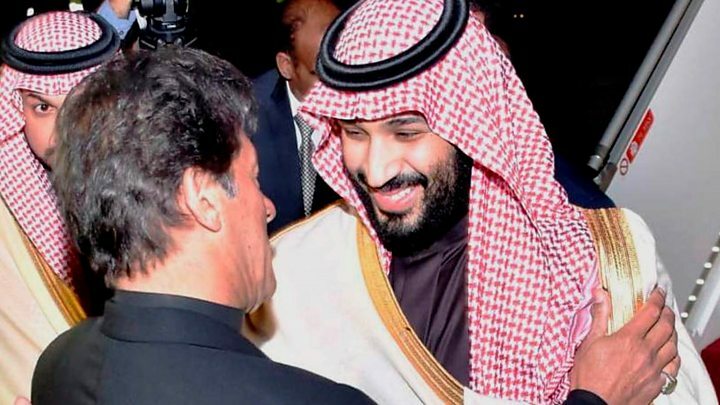 While Pakistan stands to benefit from Saudi Arabia’s largesse, the south Asian country is also important to the kingdom. The two countries have a long-standing military relationship and the MBS visit comes at a time when geopolitics in the region are shifting – including concerns over the influence of Iran.